To those of us who happen to be working out to what seems like all our lives, selecting a new gym to call home away from home is an easy matter. But for those who infrequently visit a gym or never have, the task of selecting the best gym to meet your needs and goals might be intimidating and overwhelming. So where to start? Create a list of criteria of what gym will best fit your goals, interests, needs, and lifestyle. This will help the gym that is right for you stand out from the rest of the pack. Here is what you should consider. Want to lose weight? Tone up? Reduce stress? Get fitter? Increase energy? Socialize? Train for an event? Whatever your reason or reasons may be, write them down and a realistic timeline with benchmarks and a final goal date. Or perhaps this is no end date as this is now a lifelong commitment. Determine if you are a morning or evening workout person and the distance in miles or drive time you are willing to attend a gym. Then which makes more practical sense to you, belonging to a gym that is close your house, office, or even the daycare center or your child’s school? Do their open hours fit your schedule? Is there a separate workout room for women only if desired? Do you prefer the lush of a high-end spa gym or are the basics found in a Y just fine with you? And just as important as the other factors, how much are you willing to pay for a membership? Decide all before venturing. What style of working out interests you or will keep you interested and motivated plus yields the results you desire? Possibilities include: body combat, boot camp, cardio, cross-fit, kickboxing, Pilates, spinning, step aerobics, swimming, Tai Chi, team activities, water aerobics, weight training, yoga, Zumba, and others. You might have to try a few to determine. When it comes to the available equipment, what is the number of pieces so that you do not have to wait or your wait is lessoned? This especially applies to the cardio equipment, including treadmills, Stairmaster, ellipticals, rowing machines, and stationary bikes but also to the circuit training equipment, free weights, and training accessories. Next, which gym amenities are must have’s besides the basics of perhaps a clean locker room? Here are several to consider: aerobics room, basketball courts, dance studio, daycare center, dietitians, exercise classes, indoor swimming pool, Jacuzzi, juice bar, masseuse, outdoor swimming pool, personal trainers, racquetball courts, restaurants, retail store, rock climbing wall, running track, sauna, snack bar, spinning room, tennis courts, and whirl pool. Other considerations for selecting a gym is what is its reputation in the community and what credentials do the staff have? Are there any reciprocal agreements? What is the cost for a guest pass? How often is the equipment updated? 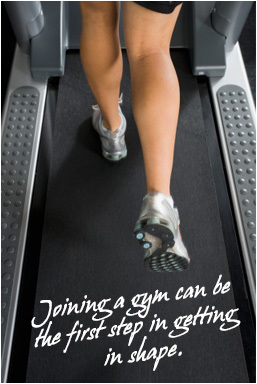 Finding a gym that is right for you can be as enjoyable as getting in the gym to workout. Plan ahead and you’ll be one step closer to achieving the results your desire.